Chai spices sings of many flavors. Made of cardamom and cinnamon, cloves and ginger, peppercorns and rose, Chai tea can also be incorporated into an aromatic and flavorful dessert. Chai spices offer warm flavors which is why they carry so much appeal for me this time of year. Like any strongly flavored food, the spices used in this chai tea jello mousse recipe, convey an ulterior benefit: that of ancient medicine. Just as common culinary herbs carry medicinal uses, so do spices like ginger, anise, black pepper and cardamom. Ginger, star anise and cardamom are typically used to ease stomach upset and promote digestion (though all are used in many and varying remedies), which makes them particularly well suited to desserts or after dinner teas. Similarly, black peppercorns stimulate the secretion of hydrochloric acid and, therefore also support digestion. Rose, an atypical but not outright unusual ingredient in chai, is very relaxing. If you enjoyed my Chocolate Chai Spiced Muffins, you will love this recipe unless you don’t like jello or anything related. Normally, I am wary of eating anything concealed. Even as a kid, I would invariably pass up on jello. I decided to put my aversions of jello aside for this occasion and put this recipe to the test. This chai jello mousse offers a lovely finish to a meal on cold autumn and winter evenings. You can also use berry flavored tea or green tea for this low carb tea dessert recipe. I originally intended to do that but green tea is one of hubby’s prized possessions that he won’t lend out so easily so I subsequently opted for chai tea. Chai tea jello mousse is the perfect fall dessert. It can be made dairy or parve and is delicious as well as gluten-free. Place gelatin and water in a sauce pan. Let stand for 2 minutes. Turn stove on high heat and heat gelatin till dissolved, approximately 30 seconds. Stir in tea. Set aside to cool slightly. Set aside. Beat whipped cream or egg whites till stiff peaks form. Fold in with tea. Add a pinch of salt. Cover and refrigerate for a couple of hours or overnight. Serve chilled. 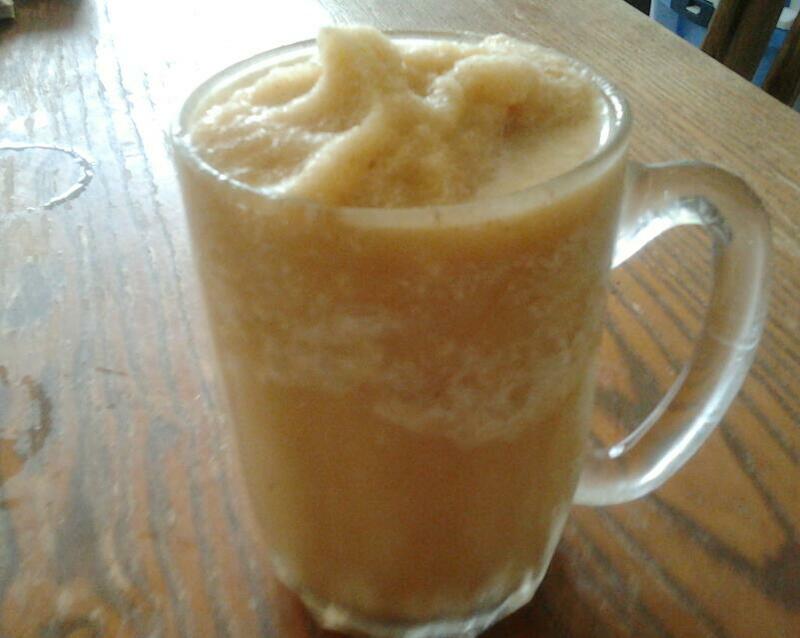 This entry was posted in Desserts, Gluten Free, Vegetarian and tagged chai spice, chai tea recipes, masala chai, tea dessert recipes. This salad recipe was originally borrowed from a three bean salad recipe. Since I didn’t have all the ingredients I needed to make such a salad, I used black eyed peas, blanched string beans, chopped red bell pepper and scallions. Otherwise, I would have tossed in some cooked chickpeas if I haven’t used them up for my turkey tagine. I have honestly never served back eyed peas with anything before so I was curious enough to give it a whirl for myself. I served this black eyed pea salad to a crowd of people who weren’t particularly raving for beans. I was astonished by the wave of compliments I received from this salad. Heck, I’ve nearly brought some of them on their knees begging for a recipe. Regardless of whether you like beans or not, they happen to be an important source of plant-based protein. According to the 2004 federal Agriculture Department survey, three of the four top-ranked foods were legume. Lentils came in second place followed by black beans and red beans. The study also found that a cup of cooked pinto beans had six times the amount of antioxidant activity as a cup of cauliflower and 12 times as much as a cup of carrots. This easy-to-make salad is a great side dish for summer feasts or any other time of the year. It is also a fun alternative to pasta or potato salad. Like most beans, black eyed peas need to be soaked overnight and then cooked for another 30 minutes or so. You can use canned or precooked frozen black eyed peas if you are looking for a short cut. This black eyed pea salad is inspired by a three bean salad that a relative of mine served a while ago. Feel free to include other ingredients of your choice aside from the ones I provide. In a large bowl, soak black-eyed peas overnight in 5 cups of cold water. Drain beans. Transfer to a large saucepan and add enough fresh water to cover by 3 inches. Bring to a boil, then lower heat to a simmer and skim the foam off the top periodically. Cook until beans are soft, 20 to 30 minutes. 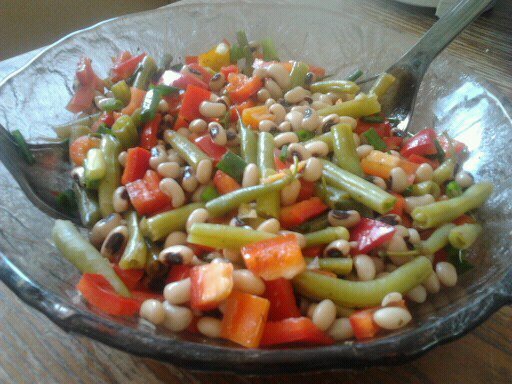 Toss black eyed peas in a salad bowl along with red bell peppers and string beans. Add garlic, chili/jalapeno pepper, parsley, and cilantro to the mixture. In a small bowl, whisk together olive oil, vinegar, salt, and pepper. Pour dressing over salad and toss to combine. This entry was posted in Gluten Free, Salad, Vegetarian and tagged black eye pea salad, black eye peas, salad recipe, three bean salad. As a novice fish cook, I find that Nile Perch is one of the easiest and quasi-hassle free fishes for me to work with. It doesn’t require a lot of ingredients nor is it technical and you can still create an exquisite fish meal. Generally speaking, fish is a great for maintaining a healthy waistline as well as a light break from meat oriented meals. Leaving a dinner table overstuffed is not the best feeling and fish will not leave you feeling so. Aside for overcooking fish, it’s hard to go wrong cooking with Nile Perch so even the novice cook can whip up a great fish dinner in no time. This recipe is one of those hassle free with very little clean up that anyone can cook. I whipped up a spicy tahina sauce to serve on the side for a more interesting and appealing presentation. Nile Perch fillets cooked to a delicious wonder with the flavor of tomato dominating over rest. The tahina sauce was complementing the taste of the fish. Most people I know are not so find with tahina sauce but it’s a healthier alternative to mayonnaise and tartar sauce. You can also use talapia or sole for this Nile Perch recipe if you can’t find this particular fish. Soak fish in lemon juice for 30 minutes. Discard excess liquid. Place balsamic vinegar, olive oil, garlic, salt and pepper in a food processor and pulse till paste like. Spread evenly over fish fillets. Bake the fish, covered, for 30 minutes. Uncover, and bake (or broil) for another 10 minutes, or until browned on top. The fish is done if it flakes (breaks apart) easily when a fork is inserted into the thickest part of its flesh. For the tahina sauce, place all ingredients in the food processor and process till smooth. Add a bit of water if sauce is too thick. Serve sauce along with fish. 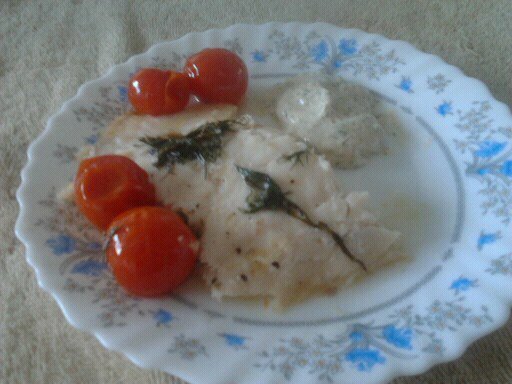 This entry was posted in Fish, Gluten Free and tagged fish recipes, Nile Pearch, tahina sauce. Moroccan cuisine often requires a tagine, a unique cooking utensil made of ceramic or clay popular in North Africa. The word alone also refers to the succulent dish which is slow-cooked inside the cooking vessel. Typically, a tagine is a rich stew of meat, chicken, or fish, and most often includes vegetables or fruit. Vegetables can also be cooked exclusively as well. Instead of using lamb in pursuant to the original recipe, I used turkey breasts for a lighter version. Instead of using a tagine in this recipe, I used a crock pot which I recently purchased. Crock pots can go way beyond stews and are great when you need to cook in a hurry and I was very pressed for time. In the morning or early afternoon, place all ingredients in the crock pot and slow cook it…by dinner time you will have a one pot, aromatic dinner that is sure to please all. Serve this turkey stew with wheat berry, rice, or whole wheat couscous. Sauté onions and garlic until translucent. Add spices and sauté for one minute. Place onion and spice mixture in preheated crock pot. 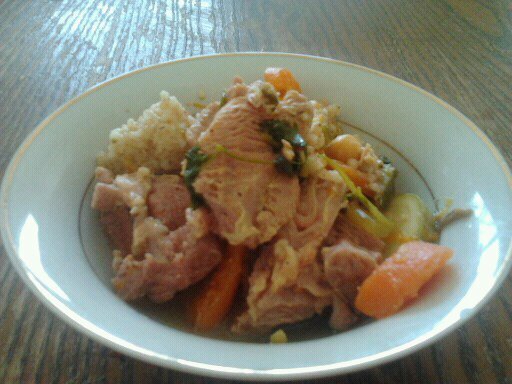 Top with turkey, vegetables, apricots, lemons and can of diced tomato. Pour in chicken broth. Cook on high for an hour and a half and then on low for another hour. Season with salt and pepper. This entry was posted in Gluten Free, Meat and tagged boneless turkey recipes, crock pot turkey recipes, Moroccan cuisine, succulent dish, Turkey Stew, Turkey Tagine. Sometimes known as christophene, christophine, cho-cho, mirliton, and merleton, chayote is an edible plant, which belongs to the Cucurbitaceae familly, as do melons, cucumbers and squash. Chayote squashes are pear shaped with thin green wrinkly skin and white flesh. They are one of the well-recognized field vegetables in many central-American regions and in some southern US states. The root, stem, seeds, and leaves of the plant are all edible. This vegetable is bland and can be eaten raw, cooked, mashed, baked, boiled, fried, or even pickled. Chayote is rich in amino acids and vitamin C. While I am the only squash lover among my peers, this chayote soup recipe has miraculously won the approval of those who have tasted it. All it needs is some seasoning and some veggies to back it up. You won’t even notice the difference. Chayote squashes and recipes that come along with them are a great way to conclude the brutal summer heat and welcome in autumn. They along cilantro are at their peak this season. There are also plenty of people I know who have a peculiar (or not so) aversion to cilantro. While cilantro emboldens the flavor in this chayote vegetable soup, you can always opt for fresh parsley. I pureed some of the vegetables to make this soup more appealing to the eye. I used a combination of summer and autumn-winter vegetables. Black bread and salad are great accompaniments for this hearty soup. Soup is generally is an excellent way to start a meal, especially if you’re trying to cut calories. This particular soup is very light, getting most of its calories from the one potato. Place chayote, potato, carrots, onion. crushed tomatoes, and broth in a stock pot. Cover and allow it to simmer for 20 minutes or until the vegetables are tender. Puree with a hand blender or in batches with a standing blender. Add the chickpeas and mixed vegetables and allow the soup to cook for another 10 minutes. Stir in the cilantro. Season with salt and pepper. Serve hot. This entry was posted in Gluten Free, Soup, Vegetarian and tagged chayote soup recipe, chayote squash, chayote vegetable soup. As simple as cooking eggs for breakfast may seem, let alone scrambled eggs and an omelet, I sometimes struggle to achieve the perfect results. For instance, I initially intended to make myself an omelet burrito for breakfast. Predicatively, it never materialized. So this evolved to a scrambled egg recipe by default. Chucking out the entire batter of eggs was not an option for as I don’t believe in wasting food. Ever. Making the perfect scrambled eggs doesn’t have to be so difficult. I’ve learned that whisking the eggs thoroughly and vigorously before cooking them ensures that. Whisking incorporates air, which produces fluffier scrambled eggs. Overcooking is a common problem with scrambled eggs which I confess to be guilty of sometimes. For starters, scrambled eggs should never be even the slightest bit brown — that means they’re burnt! 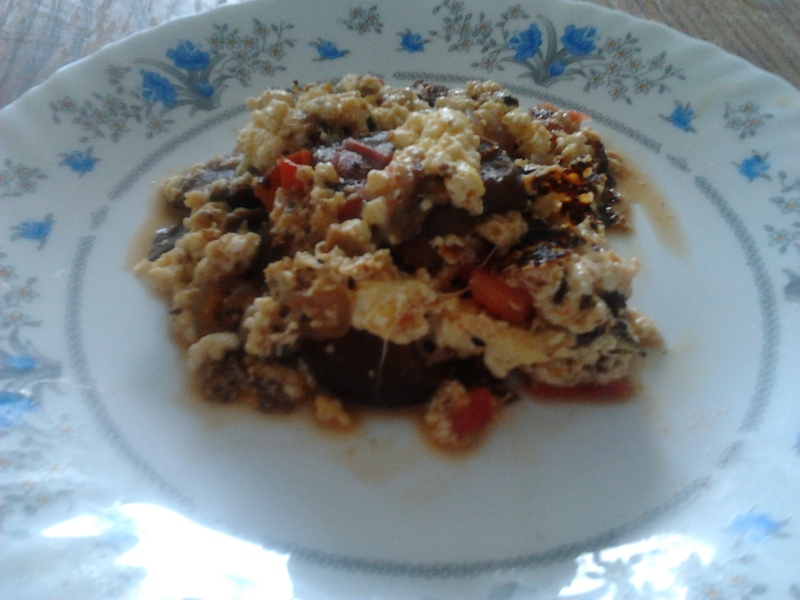 In case you are wondering, the black stuff features in my picture are bits of eggplant. I threw in the remnants of vegetables from my vegetarian Philly cheese steak sandwich recipe for a more filling and nutritious balance. If you don’t want vegetables with your scrambled eggs, you can leave them out. Anyhow, the perfect scrambled eggs should be soft and just a little bit moist. Last but most importantly, eggs should always be cooked in a nonstick sauté pan. You should always use a heat-resistant rubber spatula for that reason. Although this scrambled eggs recipes yields 2 servings, you can always double the recipe. This scrambled egg recipe serves well with a slice of toasted bread. You can even stuff them in a pita or a bun and eat it as a sandwich. I hope to share an omelet burrito recipe once I perfect it. Its pointless publishing a defective recipe, don’t you agree? Crack the eggs into a glass mixing bowl and beat them until they turn a pale yellow color. Heat a heavy-bottomed nonstick sauté pan over medium-low heat. Add the spread and let it melt. Add the milk to the eggs and season to taste with salt and white pepper. Whisk for as long as you possibly can. When the spread in the pan is hot enough to make a drop of water hiss, pour in the eggs. Let the eggs cook for up to a minute or until the bottom starts to set. With a heat-resistant rubber spatula, gently push one edge of the egg into the center of the pan, while tilting the pan to allow the still liquid egg to flow in underneath. Repeat with the other edges, until there’s no liquid left. Turn off the heat and continue gently stirring and turning the egg until all the uncooked parts become firm. Don’t break up the egg, though. Try to keep the curds as large as possible. At that point, you can add vegetables or other ingredients of your choice. Transfer to a plate when the eggs are set but still moist and soft. Eggs are delicate, so they’ll continue to cook for a few moments after they’re on the plate. This entry was posted in Bread, Dairy, Gluten Free, Vegetarian.